I have recently become president of my fraternity and I need help. We have a severe case of success having bred apathy which means I have a lot of guys that think since we are the best on campus so we can stop working. There are a lot of guys that are only here to have fun and party. Also, our meeting structure needs to be revamped because I think that this is part of the reason why we have low attendance at meetings? How do I best run a fraternity meeting? 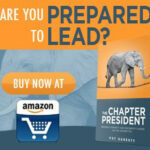 How do I motivate and re-gear that fraternity to have a complete buy in from my actives? How do I convince the guys that we need to do the not fun stuff? First, you need to understand this is completely normal. There is a business cycle to any operation, and fraternities are no different. No matter how good you are or what you do there will always be ups & downs. The best you can do is extend your plateau at the top, shallow up the decline, or shorten your stay at the bottom of that curve, but that cycle IS inevitable. That cycle is inevitable in large part for the reasons you mention. You have a bigger chapter, more money, the easier fraternity recruitment is, and you have more stability in your leadership. That means not everyone has to be firing on all cylinders for things to go well. They get lazy and complacent. That’s human nature. At the same time, there’s other fraternities around you that are hungry. Sometimes it leads to a gradual decline, but you’re also vulnerable to a catastrophic incident that knocks you back to reality. You have to be vigilant, and as a top fraternity all eyes are on you. Your specific questions are pretty simple. How to run a meeting? Quick and painless while giving plenty opportunity for input on stuff people care about. If your meetings are arduous, it’s probably because your executive committee meetings before hand are not. It’s a representative democracy. Your officers were elected to lead, not ask for permission in everything they do. The fraternity meeting isn’t a meeting of their committee to talk over every detail of what they’re doing. Most officer reports should be a couple bullet points and done. Of course there are things that require discussion or consent of the fraternity. That’s why you’re really having the meeting in the first place. This is important so everyone feels they have a say in the decisions. However, you need to prioritize and limit the time on each discussion point. Make and stick to a written agenda. Pass out copies so everyone knows how much more you have to cover. You should be able to get through most meetings in an hour. Just keep control and keep the pace moving. If you can’t get to something in the allotted time, then table it till next week. If it’s too important to wait, then you didn’t set your priorities very well for what you did cover. If you need to change the order officers report in every week so that you have the important stuff up front, then do that. You can use some other resources to reduce the amount you need to talk about at meetings. I’m sure you have some kind of listserv on which your members privately communicate. You can put out a lot of information out there that can just be glazed over in the meeting because they already know. A members section of a website where you individual officers can post updates or even upload documents works really well to. You have a secretary and a vice president, make them do some work. How do you motivate the fraternity to gain buy-in from most/all actives? Peer pressure and mob mentality honestly. Seriously, you need to really understand the word vision. Then you need to work with your leaders and alumni to create one. Once you have that, then you need to exercise some leadership by inspiring first key leaders, then the core, then the majority of your fraternity to get on board with that mission. As you gain momentum, those supporters will peer pressure the followers to get in line. Vision is less complicated then some people make it sound, but it is critically important. It can’t just be a set of short, mid, and long range goals. It needs to be inspiring. You can’t ensure your fraternity will still be on top in 10 years, but what things can you leave as a legacy? Is there another level above where you are right now? Are you the best fraternity in a below average Greek system? Is your Greek system maybe primed for a jump to the next level? What can you do to make that happen? You need to step out of the box and ask some questions of yourself that cause you to look beyond the smallness of your current situation. 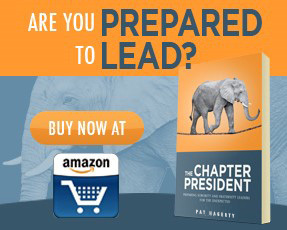 You need to imagine some greater world for your fraternity you’d like to achieve. Show that to your fraternity and then show them how it’s achievable. You want to be at whatever point in five years, okay then backwards plan. That means you need what done in four years or three down to what do you need accomplished this month. Distribute work, set schedules/deadlines, hold people accountable and reward success. Your biggest job should be moving around resources so your people can accomplish their short and mid-term goals toward the vision. As long as they believe in the mission, you keep them fired up about it, and people do their jobs then it’ll most likely get done. If your fraternity isn’t on board, it’s because you haven’t given them anything to be on board with. If there’s anything we care about in fraternities its tradition. If you talk to these guys about leaving behind a legacy and show them something they want to make happen, then they’ll support you. If that still doesn’t work, then get your Greek life office to have David Stollman (LINK) as one of those mandatory speakers they’re going to make you sit through anyway. I have no affiliation with him, but he’s got a good message on this subject. How do you convince guys that you need to do the not fun stuff? Getting buy in on the vision will motivate them to do work contributing to those higher goals. That’s what really matters. There are surely some boring requirements from your school. Stuff like those mandatory speakers. You can’t do anything about that. Just make sure you meet minimums so you can check the box and move on. The penalties for the fraternity should be motivation enough. If not, you can always make it a mandatory fraternity event & issue fines, or go the alternate route with an incentive points system. Then you get to stuff like philanthropy. What are you doing and why? Does anyone actually care about the cause you’re supporting? If they did they’d be there and motivated. Is there something else you can be doing that they would care about? Practical concerns are valid too. If you’re doing this primarily for PR, is helping this particular cause really changing university/community opinions about Greeks? Would something else be more effective? What are you doing? Would you rather be picking up trash on the side of the road or selling tickets to a band where you’re going to have a VIP section with a sorority and donating the 3k in profits to that sorority’s philanthropy? Make it fun. I find raising money is harder work but more fun than volunteering time. The kicker is you can log the work you do to raise the money as volunteer hours. Again, you can go with a points system to incentivize behavior people wouldn’t normally want to do, but I personally don’t love that idea. I think it takes leadership to get the bulk of your people to do something. That’s your fraternity elected you. 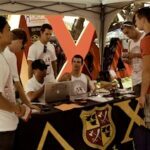 – This answer was written by Dennis Nall, an alumni brother from Alpha Tau Omega and new contributor for the thefraternityadvisor.com. 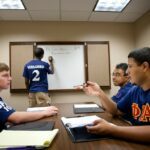 If you are interested in writing for thefraternityadvisor.com – let us know (CLICK HERE)! Should We Merge with Another Fraternity? How Does My Fraternity Have a Good Rush Week? Good point. I should have talked about a retreat. Every time I’ve gone through the vision development process with a chapter, that’s been the technique. Don’t get me wrong, you might go in there with the answer before you ask the question, but at minimum you need people to think they had input if not thinking it was their idea in the first place. That’ll get you a buy-in a lot faster than trying to sell them something they aren’t initially interested in. You don’t need to be a salesman so much as a presenter and recruiter. Make sure to involve advisors also. You don’t want your alumni assoc, housing corp, and chapter all working toward different and conflicting goals on different timelines. This may be a process. between a couple retreats and working with alumni, but you can do it. In addition to Dennis’ excellent insight, I’d add one thing. Maybe the fraternity is not motivated because they didn’t have much input on what the chapter is doing. It is the perfect time of the year to have a retreat or strategic planning meeting. During that meeting, find out what the brothers want from the fraternity. This should provide a great roadmap for the leadership team. Also, I second that David Stollman is pretty awesome. I know he is a follower of the site and one of the truly great guys in the Greek world. His presentation is a must-see.